Last night I finished quilting 5 more squares on the baby quilt before my fingers were so raw and bloody – ok, NOT bloody – that I had to stop. And I sat there and sweated through every one of them. We’ve managed not to turn on our A/C yet and I’m trying to keep it that way for as long as possible. I’m just not ready to have another $400 electric bill. Ugh. So there I am up in the loft – remember heat rises – listening to the TV, windows open, fans at full blast with a blanket on my lap. I seriously considered stripping down to the bare essentials, but I was already in shorts and a tee shirt and I didn’t think anyone would really appreciate a quilt made for their baby while naked. Well, maybe some of my friends would. They are just crazy enough to think it funny. Happy Earth Day! Save some energy! Open your windows, turn on a fan and make something naked! PS – if you’re in Texas, today HEB is giving away free reusable grocery sacks in exchange for 5 plastic grocery sacks (or 5 buddy buck bubbles). 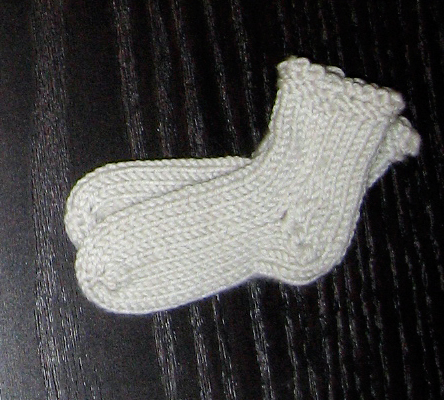 I don’t know what my problem is, I’ve had this adorable pair of socks and baby sacque done for weeks and I couldn’t get it posted. The pattern is Knitting at Knoon’s Sweet Pea (what is my problem? I consistently type “Sweat Pea”…), and the yarn is the suggested Debbie Bliss Baby Cashmerino. As cute as it is, and as perfect a baby gift it will make, I don’t think I will ever do this pattern again. Can you say “boring”? 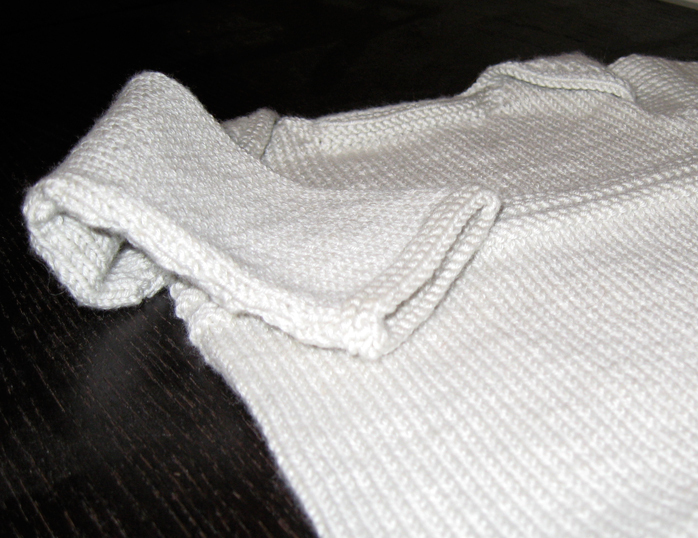 I’m talking about stockinette stitch. On size 3′s. For miles. I thought it would never end, and just when I thought I was done with it, and could do (whee!) reverse stockinette, that is, when I reached the end of the decreases – which were themselves like 15 rows apart – I double checked the pattern and see that now I’m supposed to continue for another four inches. 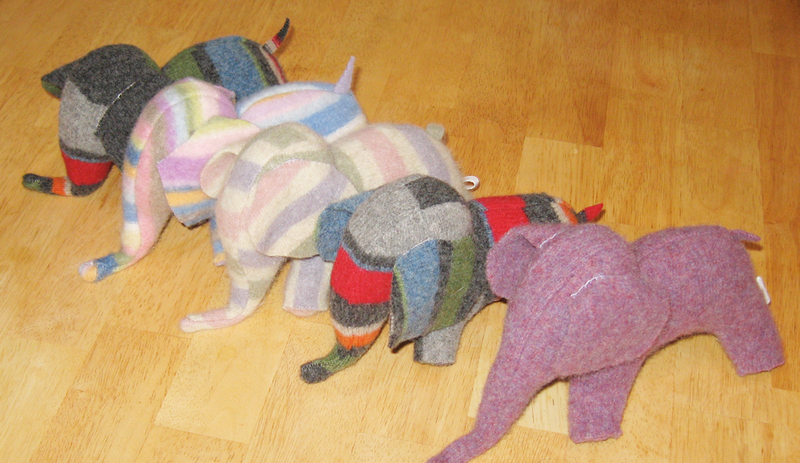 Yeah, I put the knitting down and walked away. So now I’m on the hunt for something a little less traditional. But still cute! It must be cuuuuute. And I’m flat out rejecting anything that has even a few rows of stockinette. I think I’ve met this year’s quota. Bleh. I’m scouring Ravelry, but it seems like every FO or pattern on there is from the same three patterns. 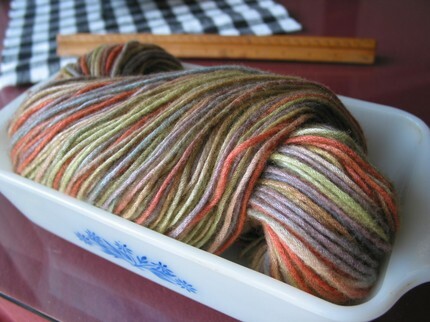 I’m thinking some sort of rainbow variegated yarn would be nice. This mommy has a completely different style… think, Grateful Dead meets Paul McCartney and Bobs Dylan and Marley. And throw in just a touch of Mary Poppins. She’s also my oldest friend. So it has to be perfect whatever it is.